We are moving forward... veryyy slowly. The day after our "storm day" in the tent, we woke up to a beautiful morning. Cold but clear and with only a slight breeze from the southeast (just as the Inuit would predict it Uangnaq wind was followed by Nigiq wind). Aksel and Cassie were in lead and we were cruising! 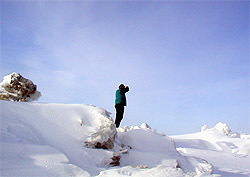 Out here on Hudson Bay, the ice is usually covered by a thick layer of hard packed snow. So dense, in fact, that it can be difficult to dig a shovel into it. In some places, the wind has blown away most of the snow and only a thin layer of very crisp ice-like snow remains. At about 2.30 pm that day, we hit one of those ice/snow patches. We were initially thankful for a change from deeper snow because traveling is very fast on this type of surface. The sleds glide effortlessly and the dogs pull against "nothing." However, our smiles quickly faded - this was not the "good ice" of our hopes. It was glare ice. The strong winds had removed even the tiniest trace of snow leaving only a mirror like surface for the dogs to cling to. The dogs seem funny as they sometimes look like "Bambi on ice" as their legs slip or slide beneath them. The really bad part began as we encountered small hard packed bumps and patches of snow scattered throughout our path. When we hit them, the sled stopped instantly. The dogs could not gain enough purchase to pull because of the slickness of the glare ice. They were trying to hang on simply by using their nails. With the amount of traction they had, it would have been difficult for them to pull a milk carton! And neither could we for that matter. Eventually, we gave up. It was completely impossible to go any further. We were totally frustrated. After some thought and consideration, we decided that we had to reach "snow pack" at any price. This meant we would have to take a 90 degree turn left , due west, and head straight into a belt of pressure ice. The long ridge spanned for miles and once there we would be separated from land. 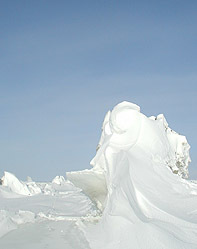 This particular section of ice was formed as tides pushed up huge chunks of ice over the tidal zone. The result was jagged mountain like formations made of rough ice. To go up and over one of these ridges would be suicide. We could easily get permanently caught in large cracks and deep pits of snow. A brief glimpse into the "Death Zone" reveals jagged plates of ice and deep pockets of snow. Those same ridges, unfortunately in this case, were our only choice if we wanted to move forward. Moving one team at a time we carefully maneuvered out of the glare ice and into the mass of pressure ice. Off we went into the "Death Zone" - as we affectionately named it. We tied a rope to the lead dog which Mille guided by running out in front of the team. Paul struggled, pushed, and shoved on the back of the sled while simultaneously trying to steer. Finally, we found a place with a little space for the tent and the chains for the dogs. Then, we walked back out to get the other team and struggled them into "camp" as well. If it wasn't hard enough already, this sled was also stuck on a huge chunk of ice, and we finally had to unload the sled and carry the gear ourselves - it was just too much for the dogs. It was very late when we made camp. That night, we could feel and hear the ice pushing, grinding, and moving while the 12 hour tide came in - pretty scary stuff. We were both very happy to leave the next morning. Again, we took one team at a time, slowly weaving our way back to land, actually, the mouth of the Seal River which was one probable cause of all our trouble. We had to go way inland and up along the river just to get around all the bad ice. Even the river ice was pushed up pretty badly, making deep pockets of snow and high ridges of sharp ice. In between, was thin ice that we easily broke through. It got even worse as we traveled across overflow (this is when there is water on top of the ice!!). HA! We are getting all tough stuff right from the beginning. In one day, we traveled 12 or 15 miles total, but all that only added up to 4 miles of forward progress. But, the dogs are dealing with all the hardships in beautiful style - even the "pups". They were all pulling while we were pushing. Our sleds are so heavy that neither of us can even budge one. We figure each sled weighed about 1400 lbs. when we took off from Churchill. Of these enormous loads, approximately two-thirds is food! Here is a typical dinner with, of course, lots of butter within close reach! Consider our daily efforts and you can begin to realize the importance of eating out here. We need to consume between 5,000 and 6,000 calories a day. We tend to crave fatty foods. Instinctively, our bodies know that foods high in fat have more calories pound for pound than foods high in carbohydrates. So, a very large part of our diet is butter and cheese. The more we eat - the more energy we will have and the warmer we are. Out here, you truly think of your body as a car. We think about fuel - i.e. food - from when we wake up until crawling into the sleeping bag at night. Your body becomes an Arctic Engine (check out the collaboration zone: Arctic Engine). Besides lots of fat for producing body heat and staying warm, a balanced diet is critical for morale and clear thinking. Our judgment can easily become impaired without meeting our daily nutritional requirements. Muscle refueling carbohydrates are also essential to power our heavy exercise. We must not deplete our glucose and carbohydrate stores. This is not so obvious while out here, because we do not feel "cold" from not eating enough carbohydrates. We eventually start feeling kind of "starved". Our body sends a "starving signal" - the same feeling you feel if you skip a meal or two or are dieting - and it results in fatigue. It is sort of like hitting a wall. Many marathon runners (except for our Lotus friend Mairead) hit "it" at the 20-mile mark . To avoid that energy "bonk" and ward off droopy spirits, we make sure we get lots of carbohydrates from oatmeal, granola, bread and bagels, energy bars, pasta and rice (see more about what we eat every day here). We carry 30-45 days worth of food supplies on the sled, so each food choice must be worth its weight in either calories or carbohydrates. For snacks we have dried fruit, nuts, gorp (trail mix) and chocolate! We also carry spices which make noodles considerably more tasty after the 10th day in a row. We have curry, hot peppers, paprika, oregano, dried garlic, lemon pepper, dried parsley, cinnamon, soy sauce, hot sauce and ketchup! (yes, it freezes solid). Lipton was once the runt of the litter, now he is one of the biggest dogs. He loves to eat! The formula for our dog food is very advanced and nutritionally well planned. It takes up most space and weight on the sled! The dogs eat about 2 - 2.5 lbs. 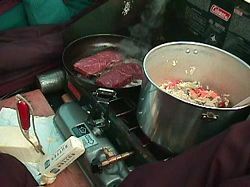 of food per day throughout the expedition. They get two kinds of food. First, each dogs receives a chunk of Endurance, a special high-fat food mix for long lasting energy. 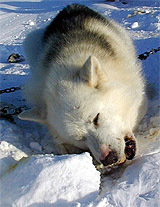 It has been formulated especially for the Polar Huskies over the past 15 years by Hill's Science Diet. The food comes in the form of a dense brick: each weighs 1 1/2 lbs. and contains a little more than 4,000 calories. To add fiber, we also feed Science Diet Active formula, a dry kibble type food (just like what you can buy in the store at home). Both of these have a high nutritional value. On extremely cold days, we feed pure chicken fat. The best eater out there is definitely Lipton. When he was a little puppy, he was the smallest in his litter and we actually had to help him eat because all the other pups kept pushing him away. Eventually, he grew bigger and bigger and became the biggest pup of them all! He would just lay right in the pan with dogfood and eat all day. Today he is one of the biggest dogs! In order to meet the energy requirements of our Polar Huskies, we use a special dog food designed by Science Diet. 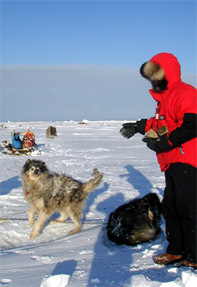 Traditionally, the Inuit did not carry all of their food with them. They carry some supplies with them, but would mainly live off the land as they traveled. They were most often not going from point A to B in a certain amount of time. They were traveling solely to find and follow food, which is the basic definition of a nomad. When on the ice, they would stop to hunt seals. When one was caught, it meant fresh meat for themselves and their dogs. It also meant light from the oil fat of the seal, clothing from the skin, tools from the bones, and thread from the sinew! The Inuit were subsistence hunters and gatherers, and survived that way for thousands of years. They hunted to feed and clothe themselves and no other reason. They also gathered vegetation, such as berries and seaweed to supplement the diet during spring and summer. When we look out our tent door, it is hard to see how they were able to survive. Sources of food are sparse at best. No super stores, eh! No breakfast cereal, no salad, no tomatoes, really not very many plants or veggies of any kind can survive here. So, because of the short growing season, the traditional Inuit diet was heavily based on the results of the hunt, by land or sea. There are few edible greens and berries gathered from the land in the summer, such as the tart lemon mountain sorrel, arctic blueberries, cranberries and crow berries. And then of course there is "Arctic Salad" - which is a lichen. The most popular one is a black leathery version growing on rocks called "rock tripe" (Umbilicaria). Now of course you may ask, "How did the Inuit get enough vitamin C?" ...especially if you have read one of the many historical accounts of white explorers dying from scurvy. The answer is simple. The Inuit ate much of their meat raw. Raw meat contains vitamin C whereas cooked meat doesn't. Also, seal is an excellent source of vitamin C. As for us white explorers out here, we get our daily dose mainly through energy bars, but we also brought a few lemons as well as vitamins! The food traditionally eaten by Inuit is nowadays called "country food." One of our favorites is maktaaq, which is the outer layer of skin from whales (beluga or narwhal), which is served raw. It has an extremely high calorie content so you are almost "burning" when you eat it. For the same reason, we can not eat too much because our stomachs are not use to it. Another favorite is Eskimo Ice Cream (check out here how to make it!). We are always very fortunate to be invited into the homes to share great food when we travel in the North. People of the North are very generous. It is because, through sharing, that the people here have been able to survive this harsh environment. Food is a very important part of Inuit culture. All celebrations include a feast. The Inuit have an important saying, "food taste better shared with family, relatives and many other people!" Our campsite is perched precariously in the shifting pressure ridge. 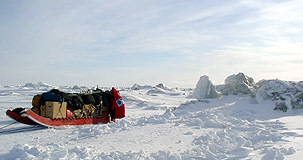 The moans and groans of moving ice made for a restless night in the tent. We had hoped that we would be in Arviat - the next village - by now so we could show you some cool photos and tell about any "exotic" arctic delicacies we might be lucky enough to taste there. But we will have to save that for next time. Actually, join us for a chat in the Collaboration Zone end of this week and talk more on that subject!